Tags: David Flatman, Eddie Jones, Francois Louw, Handre Pollard, Heyneke Meyer, Joe Schmidt, John Mitchell, JP Pietersen, Matias Moroni, Michael Cheika, Schalk Burger, Vern Cotter, Willie le Roux | Permalink. My thoughts on how SA Rugby could be improved. I have suggestions for SARU to improve South African rugby. Appoint a Springbok coach that can improve the way the Springboks play. SA needs to ensure that all the Superrugby teams are coached by coaches who have embraced the modern game. Create a plan aimed at getting at least 3 SA teams into the knockout stages of Superrugby for 2016 and progressively improve on that year on year. Create a rugby culture in South Africa that players won’t want to leave even if they are offered big money. Take greater action to keep South African players playing in SA. This could be a rule that only allows players with more than 50 caps for the Springboks to be selected for the Boks if they are not playing in SA. Put a much greater emphasis on attracting larger crowds to matches. Larger crowds =better atmosphere=helps with player attitude, also earns more money. Coach the coaches clinics. Make sure that coaches at all levels are coaching a modern game. Get coaching expertise from wherever, if they can help it doesn’t matter what nationality they are. Good coaching needs recognition and reward. Steps should be taken to play teams with whom South Africa are not that familiar with, such as Japan or Canada. Lessons can be learnt from every team that you play against. Stop the obsession with New Zealand. Promote good sportsmanship. Discourage booing when an opposition team is taking a kick. Play weight category rugby, so that smaller skillful players have a platform to nurture their talent. Revive representative teams like the Emerging Springboks and the SA Babarians. A few questions for Chester. Tags: 1995 RWC, Argentina, Chester Williams, Goldfinger, Heyneke Meyer, Layer Cake, New Zealand, Stoke Park, Victor Ubogu, Zinzan Brooke | Permalink. We can’t blame everything on Heyneke Meyer. Tags: African National Congress, Apartheid, Brian van Rooyen, Danie Craven, Gary Gold, Harare, Heyneke Meyer, John Smit, Louis Luyt, Oregan Hoskins, SARU, Zimbabwe | Permalink. A look at the stats pages, people will often take note of the points difference column (PD). This is calculated by taking the total points your team have scored , points for (PF), and subtracting the total amount of points scored against your team, points against (PA). PD=PF-PA. Similarly we can calculate the try difference (TD). TD=TF-TA. Of the four teams involved in the semi-finals of the RWC 2015 New Zealand had the largest TD for the tournament with 30. Australia had the second highest TD with 21. These of course are the two teams that are going to contest the final. If you met someone who knew nothing about rugby and you had to explain to them what the point of rugby is, how would you explain it to them in the simplest way? I would say to them, your team wants to score as many tries as possible and prevent their opponents from scoring any tries. So let’s look at it from this simple explanation. 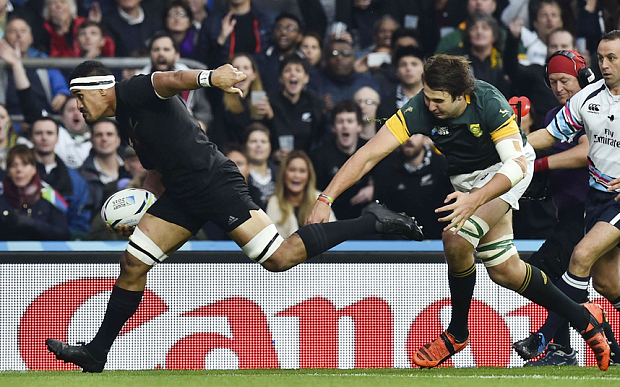 New Zealand have scored 34 tries so far in the 2015 RWC, that is more than any of the other semi-finalists. Who scored the least amount of tries out of the four semi-finalists? South Africa with 24 tries. New Zealand have had the least amount of tries scored against them in the tournament with a measly 4 tries. Who had the most tries scored against them out of the four semi-finalists? Argentina had the most with 13 tries being scored against them. We love arguing about, if they kicked too much, if they missed tackles, if they should have played more territory, gameplan, modern gameplan, Domkrag rugby, pride, respect, experience, sidestep, angles of running , offload, gainline, set-piece, turnovers, referees, dropkicks, decision making…..blah blah blah. From the table below, we can deduce, South Africa need to score more tries and Argentina need to stop tries being scored against them. New Zealand are getting it right while the Aussies are next best. Tags: 2015 RWC, Argentina, Australia, New Zealand, South Africa | Permalink. What would have happened if South Africa had played France and New Zealand had played Wales? Tags: All Blacks, Domkrag, France, Heyneke Meyer, Jannie du Plessis, Japan, Jerome Garces, Kiwi, Lood de Jager, South Africa, Springboks, Victor Matfield, Wales | Permalink. Tags: Domkrag, Duane Vermeulen, Fourie du Preez, Heyneke Meyer, New Zealand, the Bulls, the Rand | Permalink.